Datalogic PowerScan PM8300 - SCANNER ONLY. 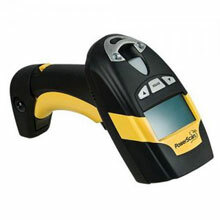 Laser Scanner, standard range, with display and 3 key keypad. For use with PreScan grocery line-busting software. Does not include necessary cables or accessories. Please call for more information. The Datalogic PM8300-D910-C005 is also known as Data Logic	DTL-PM8300-D910-C005	or PM8300D910C005	.